Noah is a high performance planning and scheduling offering for Job Shops, Fabricators, Service/Repair Shops, and others where customer service and shipping on time is vital. 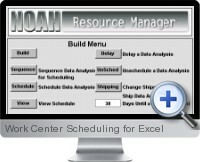 Noah will enhance the effectiveness, efficiency and consistency of your work center based planning and scheduling, including cycle time reduction. Noah features an easy-to-use method to enter resource definitions, then to build/define jobs, or projects, with additional considerations such as labor and work center operations and routing. Next, Noah allows you to perform 'what-ifs' with different plans resulting in feasible and effective production schedules. Simple, familiar interface - One step menus, on-screen buttons, or sheet tabs make navigation a snap. Easy to configure and run - Quick, intuitive layout and prompts allows you to focus on your business, instead of learning another software product. Finite capacity planning and forward scheduling - Global and/or detailed work center configuration can be made and applied instantly. Integrates with virtually all systems - Easy cut-n-paste or direct file linking (DDE, ODBC, SQL, etc.) to exchange data with any system. Powerful and Extensive Reports include Routing, WIP, ERD (Estimated Release Date), Throughput, Backlog, Exception based tracking, and Shipping.